Hanji Naty (한지나티): HanjiNaty at the Wonju Hanji Festival~~! 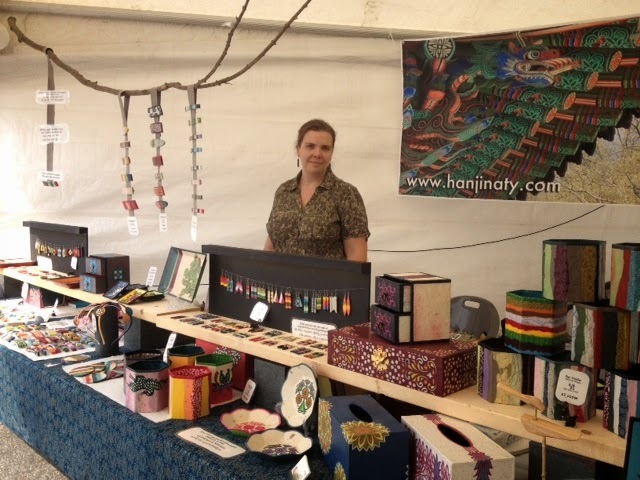 Natalie in her "HanjiNaty" booth at the 2014 Wonju Hanji Culture Festival. 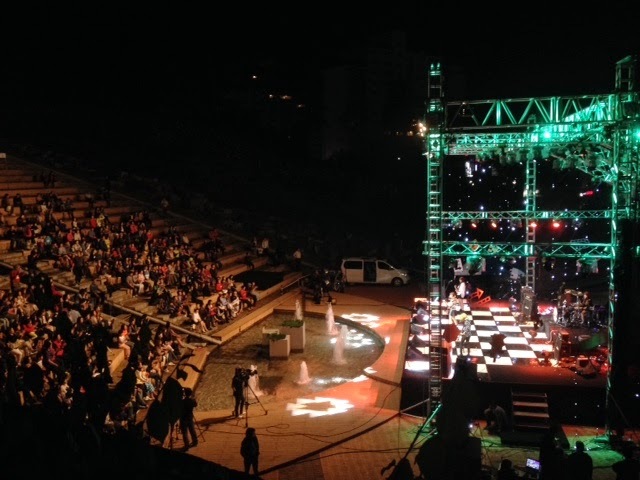 From September 25 to 28 I had the chance to participate in the 16th Edition of the Wonju Hanji Culture Festival, held in the city of Wonju (province of Gangwon, in the northeastern part of South Korea). This 4-day Festival is dedicated to Hanji paper, one of the treasures of Korean culture. During the Festival, the visitors could make their own sheet of Hanji paper, experience Hanji crafts, shop for handmade goods, Hanji paper and other Hanji-related items. There was also a Hanji fashion show and numerous musical performances throughout the weekend. 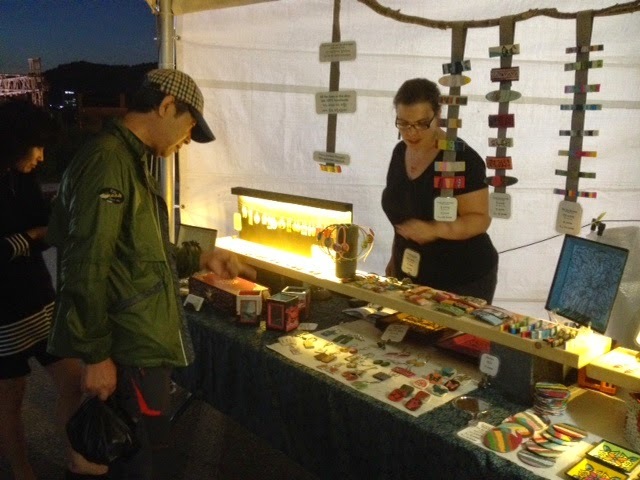 My husband Jason and I left Iksan around 4am on the 25th (Thursday), in order to reach Wonju early enough to set up our booth and get ready for our first visitors. We packed everything in our tiny car (including tree branches, countless bags and plastic bins, two by eight planks, etc.) and we enthusiastically hit the road! and headbands, key chains and pendants, etc. I was very excited, but equally anxious about the whole venture. Luckily my detailed planning paid off and we were able to set up our booth smoothly, without any missing items, panic moments or thrown tantrums! Our first visitors came to meet us around 10:30, and I was excited to make my very first sale only a few minutes after opening my booth to the public. There was a regular flow of visitors throughout the Festival, and it was especially busy on Saturday and Sunday. Let me tell you right away : having a booth in a craft show is hard! I didn't expect it to be so demanding, both physically and emotionally. We spent long hours in our tent (from 9am to 10pm, for 4 days); it was very hot during the day, and annoyingly popular with mosquitoes at night. (with integrated lighting!) and items hanging for a maple branch. One of the most important challenges that we had to face is the fact that we are foreigners in an Asian country, which means that a large number of Korean visitors were intimidated by us, or rather by the idea of talking to us; even if my husband is fluent in Korean, many visitors were taking a surprisingly large detour to avoid our booth. We tried to be as welcoming as possible, greeting everyone in Korean with a warm smile, but we unfortunately had a to struggle at times to attract people to our booth. 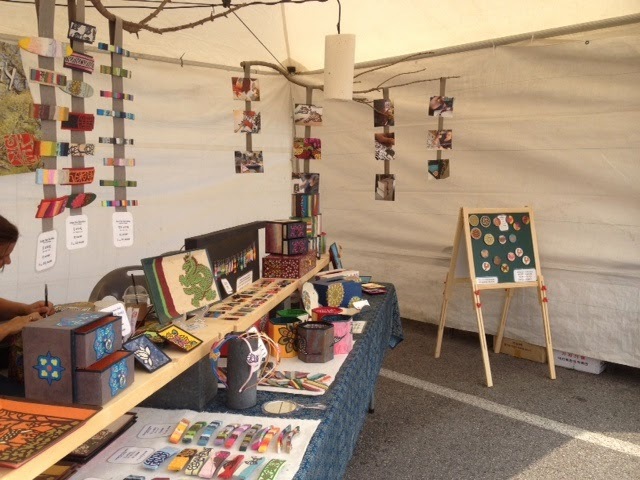 Luckily, many people were interested enough to approach and take a look at my items : Hanji paper earrings, hair accessories, coasters, plates, boxes, chests, pen holders, magnets, etc. wonderful little boy and his older sister. People were very curious about the fact that a foreigner is actually doing a traditional Korean craft! We had to answer a lot of questions, and face quite a few skeptical folks! We took the time to explain where I come from and how I came to be a Hanji craftswoman; people were genuinely interested in learning about it. Often enough, the people who took the time to discuss with us left our booth with a HanjiNaty item in hand; I guess the conversation gave more meaning to the objects they were looking at. 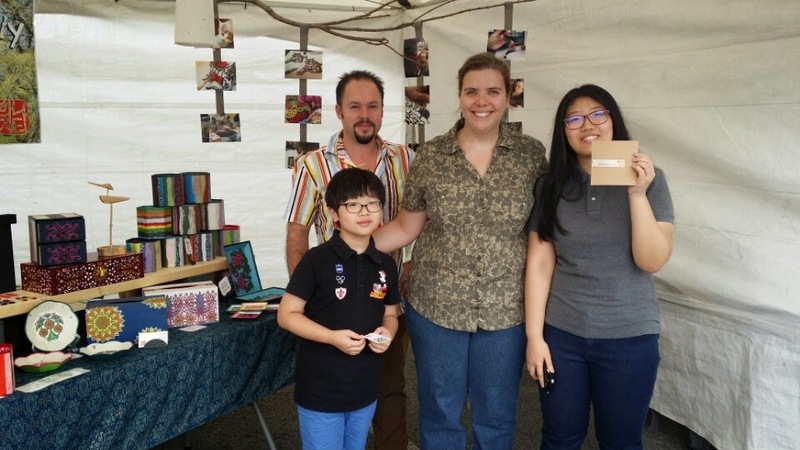 During the Festival I had the chance to meet some wonderful people, including many Korean children with their parents, expats from Europe and North America, business people, other artists and craftsmen and women, including Masters in paper making and Hanji crafts. It was by far the most exciting part of this whole adventure: meeting wonderfully inspiring people, who are interested in sharing their craft and their passions, and who are interested in hearing about mine! new patterns, for future projects! I am very grateful to have had the chance to participate in this event; beyond the financial aspects of this venture, I truly feel that I have made connections that will open new doors along the way. 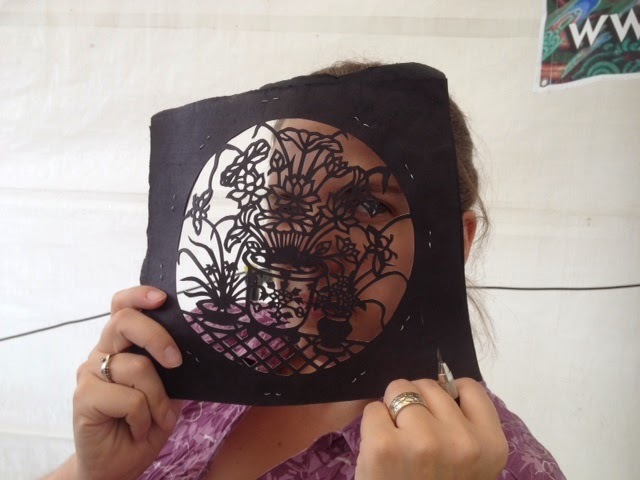 I also really enjoyed the feeling of slowing making my place in a community of artists and artisans dedicated to Korean Hanji paper, and its endless possibilities. Next Stop : Seoul ! During the Wonju Festival I found out that the first edition of the Seoul Hanji Culture Festival will be held in the Capital City next week! The Festival is scheduled for October 9 to 11, and will include a Hanji Fashion show and other performances, a Hanji Craft market and other activities. I was actually invited to join the Hanji market for this new event... Will I be able to participate? Stay tuned for more details! including concerts and a Hanji fashion show. Natalie, it was a nice adventure. I wish you good luck in Seoul as a vendor or as a visitor:))) Looking forward your next article!!! Your booth looked absolutely awesome Natalie! Very organized and inviting! Glad to hear that the set up went off without a hitch. Now that the first show is under your belt, the next one? will be a piece of cake!